And so it was off to D4 with me; peering through gated mansions as I arrived by taxi into this most genteel part of Dublin, marvelling at veteran trees and wondering why such old BMW models littered their gardens. I guess the 162 reg were used by one’s chauffeurs. An impressive line had already gathered outside the home of Mr & Mrs Jean-Pierre Thébault, inspecting the COP21 Climate notices on 53 Ailesbury Road gates. No-one was skipping the queue. I guess that’s something you learn at diplomatic school. Grovelling with the check desk to replace Tootlafrance editor (the original invitee). Despite the heavy security, they generously extended their hospitality and ushered me through. I was greeted by Mayo Pikemen and United Irishmen in original(ish) 1798 garb and treated to a welcome Humbert himself may have enjoyed. Humbert – that’s General Jean Joseph Amable Humbert to you and moi. I imagine Maman calling him for dinner “J J Amable Humbert vien ici your petit dejuener is prêt !” I’m already giddy and I haven’t had any champagne yet. Did you know JJ Amable Humbert attempted to free Ireland first time in 1796 with the Légion des Francs in the weather-cursed Bantry expedition? He returned two years later for the 1798 Killala Irish Rising. Again, the United Irish rising was nearly quenched but Humbert won the Castlebar battle and declared the Republic of Connacht. Alas, he ran amuck at the battle of Ballinamuck. The End. 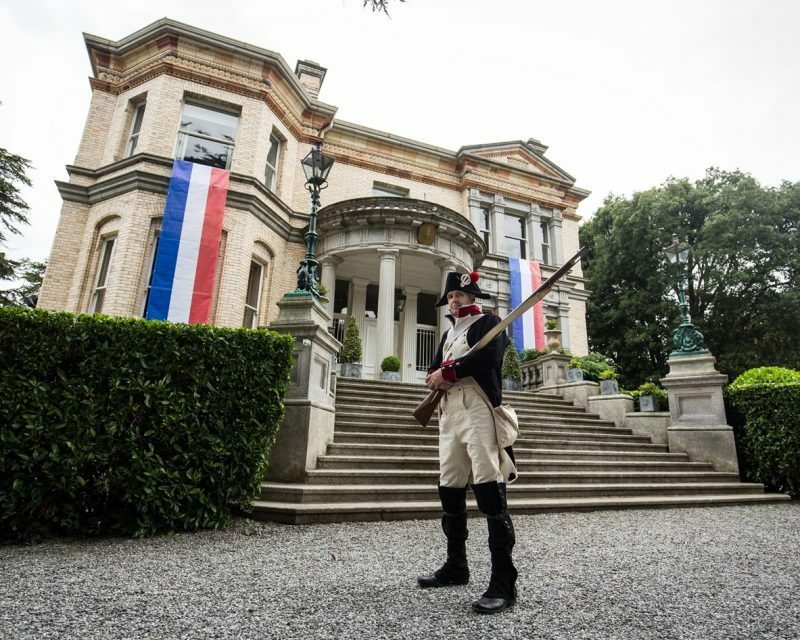 Unless, of course, you happened to be in the French Embassy Bastille day Garden Party, 2016. The 1803 French group – the Irish Legion – were fiercer than our Irish ones- ’til I caught them squabbling over whose bayonet was whose. Boys, huh! Heard one of the Irish ones say that he would not play (or rather fight) with them again because they were too dull, except for their shiny harp badges. I was reprimanded when I called their satchels handbags. I was greeted in the vast jardin by our genial French Ambassador with a soft, gracious handshake and masterly side flip conveyed in the final shake to meet his wife. I guess that smooth move is straight out of Diplomat School 101 ! Flanked by trays of Veuve Clicquot, I veered right to the next queue for food. I ended up jumping this queue, I have to admit… never did go to Diplomat School. French delicacies tend not to be vegan-friendly and so I helped my green friends there by scoffing their scrumptious Bayonne and Pyrénées cured meats, cornichons and Comté and Blue d’Auvergne fromage… Délicieux! Ambassador Thébault regaled us with tales of Irish WW2 veterans praising their strength and exceptional honour. We were encouraged to celebrate together. Since when does one have to encourage guests in Ireland to enjoy a glass or two? Then we were warned that the enactments would soon commence, with the assurance that the blank gunshots were not real but loud and terribly authentic. I guess the neighbours may just have attempted a raised botox-ed brow. A tree-planting ceremony followed and there were generous helpings of Côtes de Gascogne wine and lashing of Jameson cocktails. The audience seemed to be mostly too busy chattering to pretend to listen politely to the Paralympic Rio 2016 team accomplishments. Let’s hope they emptied their pockets upon exiting to support our teams. Only hushed whimpers joined the chorus of the Marseillaise. Amhrán na bhFiann fared no better despite the words printed on our programmes. Someone swapped a Valrhona Bonbons palet gold sign in front of the swirls of Bordier butter, and so we watched to see who fell for it. No one. At 7.30pm, the event officially ended. However, the gentry were still debating and enjoying the fine evening in their fabulous attire whilst the staff discretely packed the alcohol and whisked away. The “soldiers” were preparing to depart – returning to their normal lives in France or Mayo. I was bundled into the Mayo bus and regaled with tales of General J J Amable Humbert to much spirit and tales or Franco-Irish cooperation. It was a fitting end to a wonderful evening. Then I watched the news. Bastille day Nice News. From flowing Champagne to flowing tears. Finery finishing in shrouds. May their souls rest in peace and retaliation cease. Vive l’Irlande et Vive la France.